The traditional Orfos Villas are luxuriously decorated with handmade wooden furniture, beautiful stone walls and wooden beamed ceilings thus creating a unique village style with high standards of comfort. 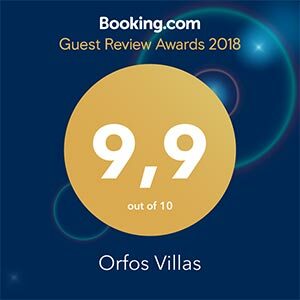 The high standards of the traditional Orfos Villas together with the high quality of services we offer resulted in international recognition by approved media, travel organizations and certification bodies. Spyros, Sophia and Pedro were waiting to greet us upon our arrival. They gave us a tour of the beautiful villa that we would call home for the duration of our stay. There was a nice welcome basket for us as well! The views were amazing. The villa had a well equipped kitchen and Sophia directed us to the supermarket where we would be able to purchase groceries. Our boys (10&12) had a fabulous time in the pool as well as playing some baseball outside the villa walls. We enjoyed barbecuing on the grill that was provided. I really cant say enough good things. We made such great memories as a family, and Orfos villas will always be a special place for us! I read a review that said "Great people wonderful place" but, it's more than that, are extraordinary people and a dream place. I recommend this location to families with children also.We will definitely come back! We just came back from our vacation trip in Zakynthos and there are no words to describe this experience. We stayed at Orfos Villas and specifically in villa Yria,which was really a beautiful villa. 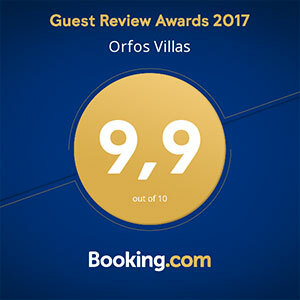 Nothing was too much trouble for the owners (Sofia and Spyros) and staff at ORFOS VILLAS. They wanted you to feel very welcomed and relaxed while vacationing at this beautiful villa. We could never imagine that breathtaking view from our villa.Personally I loved the vintage design of the villa,it was something unique. Also,The pool area was just beautiful. It was exactly what we were hoping for and we very much enjoyed our stay. We are really looking forward to visiting Zakynthos and Orfos Villas again. Place was awesome! We really loved every minute of our stay. Spyros was the most hospitable host we could ever wish for. There's even a valet guy - Petros, that helped us with the luggage, cleaned every the pool and the area around and even cooked us a barbecue dinner. The house was cleaned every day and all the towels were changed on a daily basis too. We would definitely go back again.